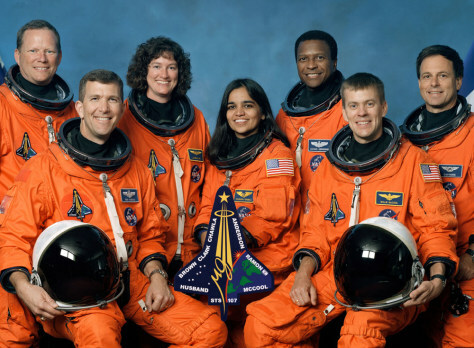 The Space Shuttle Columbia crew, left to right. Front row: Rick Husband, Kalpana Chawla, William McCool. Back row: David Brown, Laurel Clark, Michael Anderson and Israeli astronaut Ilan Ramon. Columbia was destroyed on February 1, 2003, on its return to Earth because of a hole in its wing that allowed in superhot atmospheric gases.